See the minutes 2:45 of this video where he makes his statements in favor of the Healthcare law that not only won’t let you keep the insurance plan you were promised by the Democratic Party, it forces Catholics to choose between violating our conscience by paying for someone else’s contraception, sterilization and abortifacients or paying fines for non-compliance. 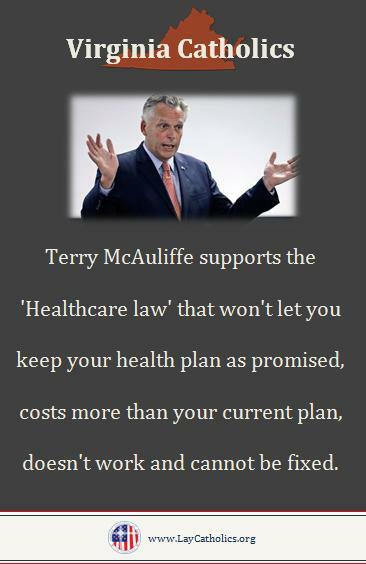 This entry was posted in 2013, Peter L. Hodges Sr. and tagged Catholic, healthcare law, ObamaCare, terry mcauliffe. Bookmark the permalink. NO PRACTICING CATHOLIC WILL EVER COMPLY WITH THIS EVIL HHS MANDATE, WHICH AT THE END OF THE DAY IS “GENOCIDE” UNDER THE DISGUISE OF SO CALLED “HEALTHCARE”…THOSE WHO DO HAVE THIS DISCERMENT ARE EITHER JUST AS EVIL AS “O” OR WORSE!!! !